Many of you might have heard of the name Liva already. I had a couple of years ago, when I had a day time job where I rubbed shoulders and worked in the corporate world of fashion. Birla Cellulose was a client I often met with, under my seniors to ideate themes for their next show or how to design their next stall for their exhibitions. There I was introduced to Liva which was always the star and the main product that had to be showcased so I always went home with tiny sample pieces to try and make things out of this almost viscose jersey-like fabric which was soft to feel and was very easy to work with (and of course mom would make her flowers). Soon after I started noticing Liva on hoardings, particularly the Global Desi ones. I sort of knew that Birla Cellulose had a tie up with a few brands, but I wasn't really aware of which ones they were until quite recently. It started with an invite to attend an exciting fashion show by Birla Cellulose with collections curated by a number of designers to have a look at Liva in action. Since I was already introduced to the fabric, I was curious to see how all these designers would use a jersey-like fabric to showcase their collections. And boy, was I surprised. Liva has long since evolved from the fabric I've seen and touched and has been incorporated into a number of other textures and weaves as well. Textiles was my least favourite subject, I always preferred the design and even pattern-making sense of fashion school, but I still appreciate a good fabric, because with the wrong kind of fabric structure, a design can fall flat, literally. 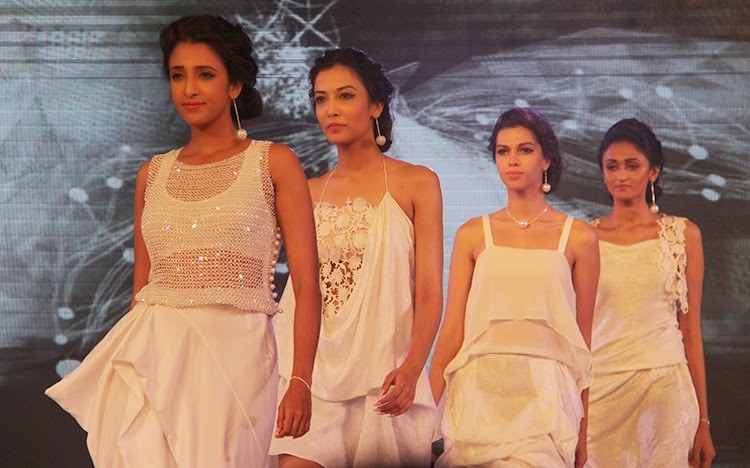 The fashion show was titled "Panchtatva" and each designer collection was modeled to incorporate a certain element of nature in terms of design and inspiration. I missed the opening to the show - which was a dance sequence I'm assuming and as I entered I saw a woman in a big dress and she was probably on stilts, but before I could blink it was over! All thanks to crazy traffic that day, but I luckily made it on time for the fashion shows. Here are the highlights of each designer showcase I managed to capture. James Ferreira has always had airy garments with subtle drapes. Here he went with a white colour palette and paid homage to air with his effortless layered drapes that billowed as the models sashayed down the runway. I liked how he added a few textures among the masses of volume. 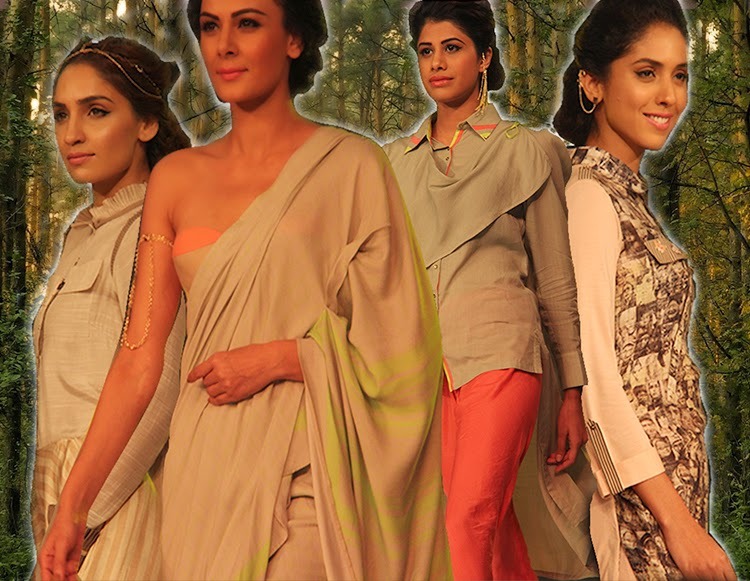 Puja Nayyar picked a very neutral palette and added drapes to a few structured garments to depict earth in all it's wonder. With small hints of neon, the collection was met with a light colour pop and I was a fan of the orange trousers and the nicely draped saree. Soham's collection that went synonymously with sky had all the resort vibes and was such a refreshing collection to watch. While I was reminded of one of Christina Aguilera's old VMA appearance from the strategically wrapped piece showcased, I was a huge fan of the prints and the maxi dress. 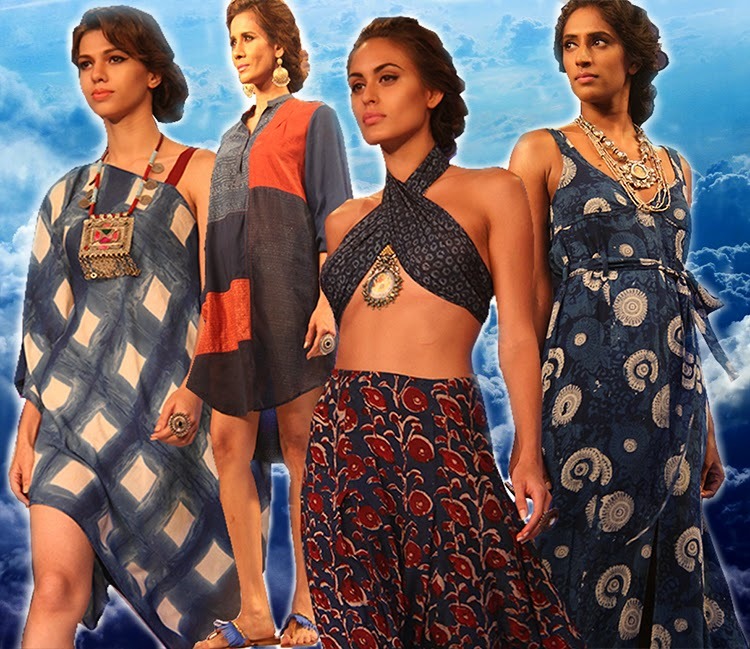 Narendra Kumar chose prints that were almost geometric and a few that looked like actual ripples to showcase water. I like how he stayed true to his style and didn't go for the literal term and tried to make all the garments fluid-like and like water. The trousers were definitely the star pieces here. 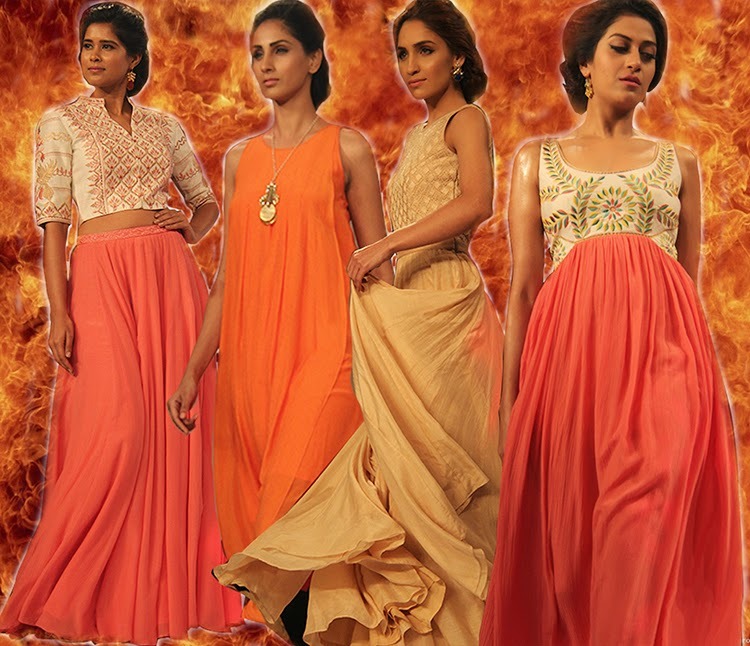 The highlight was definitely Anita Dongre's fiery collection. It was the most fabulous way to end the show. The models walked back and forth in lengthy flared dresses and even twirled on the ramp to show the fabric's ease and drape. Every single piece from this collection is my favourite! Liva is a new age fabric made from the fibers derived from wood pulp and has properties like natural sheen, softness and is a fluid-like structure which ensures it always gives a good drape (perfect for Indian clothes in my opinion). Since it's a natural fiber, the fabric breath-ability is amazing and is great during higher temperatures. Liva also boasts of consuming lesser energy and is environmental friendly. The newly introduced Liva Accreditation Partner Forum (LAPF) has made it possible for you and I to gain access to this almost magical textile via brands like Global Desi, AND, Allen Solly, Van Heusen Women, Pantaloon and Lifestyle, and a few others. If LIVA has you intrigued then please do get in touch with Media Moments (www.mediamoments.in) for further details! Chasing Waves and being "beach appropriate"